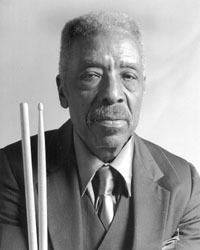 Drummer Edgar Bateman, Jr., a long-time resident of Philadelphia, died on May 18, 2010 at the age of 81. Though he was not as well known as some of his contemporaries, his playing was much admired by other musicians. His name is often mentioned in the same breath as Elvin Jones, and when you hear his early recordings you'll understand why. Edgar was a man of great warmth, generosity, and faith. He will be greatly missed by Philadelphia's jazz community. This special extended edition of the Lucky Old Souls radio show celebrated Edgar Bateman's life and career with music from all 12 of the commercially released albums that he appeared on, rare live recordings, reminiscinses from some of the musicians who knew and worked with him, and a conversation with his son Edgar Bateman III. The first six studio albums that Edgar Bateman appeared on, from 1961-1966, were played in their entirety, and individual selections were played from the remaining six albums in his discography. Thanks to Daniel Peterson, Dan Buskirk, Bobby Zankel, and Tom L. (aka the Lone Gunman) for supplying some of the recordings used for this broadcast and to Kelvyn Anderson, host of G-town Radio's Anderson Taped, who assisted in the studio. A very special thanks also to Edgar Bateman III for his support of and participation in this broadcast. The broadcast, which originally aired on May 25, 2010, from 11:30 a.m. - 8:30 p.m, is presented here in ten parts, each approximately 45-60 minutes long.